The National League East almost certainly can't involve anyone other than the Atlanta Braves and the Washington Nationals in 2013. Each has won it in the last two years, and no one else is even close to contending for even a wild card spot. 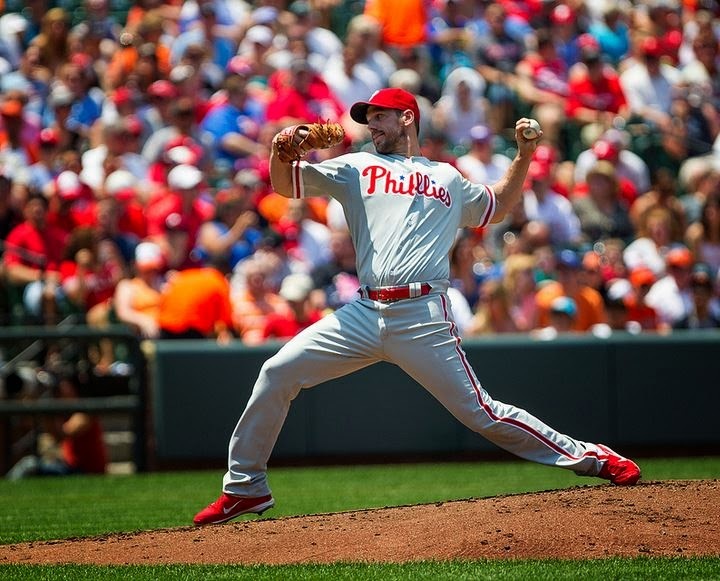 Cliff Lee, with a 7.3 WAR in 2013, was the most productive player in the National League East by that measure (Keith Allison/Creative Commons Attribution 2.0 Generic license). The National League East shapes up, by 2013 WAR, as a matter of two clubs, the Atlanta Braves and the Washington Nationals. The Braves won it last year. This year, it figures to be the Nationals, especially after spring injuries to Atlanta pitchers Kris Medlen and Mike Minor. By 2013 WAR, this is quite a close race, with Atlanta scoring 45.7 against 44.7 for the Nationals. The Braves actually beat the Nats by 10 games in 2013, but the gap has been closed somewhat with the Nats adding nearly 5.0 WAR to their pitching staff between the additions of Doug Fister and Jerry Blevins, while the Braves lost catcher Brian McCann. The other three clubs look weak here, though the Miami Marlins have a chance to come up fastest after young pitching made a good showing in 2013. Following is a list of each team in the division, giving each club's "top half" position players by 2013 WAR, its "second-level" position players, its top-level pitchers and second-level pitchers. For the top-half position players, we give the player's position and where he ranked at the position across big league baseball in 2013 WAR, then the actual WAR value for the player. For every other category, we give the player's overall 2013 WAR ranking, understanding that pitchers and position players are ranked separately. Top-half position players — 1B: Freddie Freeman 5, 5.5; SS: Andrelton Simmons, 1, 6.7; RF; Jason Heyward, 9, 3.6; LF: Justin Upton, 11, 2.6. Totals: four players 18.4 WAR. Second-level position players — Chris Johnson, 144, 2.0; Ramiro Pena, 208, 1.0. Jordan Schafer, 213, 0.9. Totals: three players, 3.9 WAR. Top-level pitchers — Craig Kimbrel, 37, 3.3; Kris Medlen, 39, 3.3; Julio Teheran, 41, 3.2; Mike Minor, 45, 3.1; Ervin Santana, 52, 2.9; Luis Avilan, 72, 2.4; David Carpenter, 90, 2.1. Totals: seven pitchers, 20.3 WAR. Second-level pitchers — Alex Wood, 177, 1.1; Anthony Varvaro, 202, 0.8; David Hale, 222, 0.7; Freddy Garcia, 234, 0.6. Totals: four pitchers, 3.2 WAR. The most striking reading on the Braves is four starting pitchers in that 31-60 range by 2013 WAR -- Medlen, Teheran, Minor and Santana — meaning four No. 2 starters. Their fifth-best starter, Avilan, is a No. 3 by these criteria. Thus, the Braves figure to win the pitching match-up in most games they play, even though this group doesn't include a clear No. 1. And they'll finish games better than anyone else in the National League with Kimbrel. The shortstop, Simmons, is the best across the game by 2013 WAR. Despite winning the NL batting title in 2013, Johnson finished 20th among big league third basemen by 2013 WAR, meaning the Braves still could use an upgrade. With McCann gone, the Braves still have a plus catcher in Pena. Top-half position players — SS: Ian Desmond, 6, 3.7; 3B: Ryan Zimmerman, 10, 3.8; RF; Jayson Werth, 5, 4.8; LF: Bryce Harper, 5, 3.8; C: Wilson Ramos, 11, 2.4. Totals: Five players, 18.5 WAR. Second-level position players — Denard Span, 110, 2.4; Nate McLouth, 161, 1.6; Adam LaRoche, 217, 0.9. Totals: three player. Totals: Three players, 4.9 WAR. Top-level pitchers — Doug Fister, 21, 4.1; Jordan Zimmerman, 28, 3.7; Stephen Strasburg, 45, 3.1; Gio Gonzalez, 49, 3.0; Tanner Roark, 91, 2.0; Tyler Clippard, 105, 1.8. Totals: Six pitchers, 17.7 WAR. The only club around here (or anywhere) for starting pitchers that looks better than the Braves is Washington, with Fister and Zimmermann in the top 30, then Strasburg and Gonzalez in the next 30. That's to say the Nats have two No. 1s and two No. 2s. And Roark, the fifth best starter on this club, comes in as a No. 3 by 2013 WAR. Add to all that five relievers who hit the top 240, and this team figures to pitch. The Nationals could have done with a little more star turning by Harper, Zimmerman and Werth. That, and the discovery of a second baseman, would give this club a complete lineup. Look how little offense we can find on a club that includes Ryan Howard, Chase Utley and Jimmy Rollins. None of these old horses even made these rankings at any level. The Phillies had to sign free-agent Marlon Byrd just to reach two players into the top half in their positions. Some pretty good pitching here between Lee and Hamels. The Phils have famously had trouble getting leads up to Papelbon as the closer. Top-half position players — RF: Giancarlo Stanton, 14, 2.4; C: Jarrod Saltalamacchia, 10, 2.9. Totals: Two players, 5.3 WAR. Second-level position players — Ed Lucas, 168, 1.5; Christian Yelich, 176, 1.4; Jeff Baker, 235, 0.7. Totals: Three players, 3.6 WAR. Top-level pitchers — Jose Fernandez, 6, 6.3; Nathan Eovaldi, 80, 2.2; Steve Cishek, 83, 2.1; Henderson Alvarez, 100, 1.9; Mike Dunn, 117, 1.6. Totals: Five pitchers, 14.1 WAR. Second-level pitchers — Jacob Turner, 134, 1.4; A.J. Ramos, 197, 0.9; Tom Koehler, 203, 0.8; Kevin Slowey, 234, 0.6. Totals: Four pitchers, 3.7 WAR. The framework for this club is the young starting pitchers, particularly Fernandez, Eovaldi, Turner and Koehler. Lots to like. And though Stanton ranked only 14th among big league right fielders by 2013 WAR, everyone knows he's real. This is a club that tore down last season and started all over. Indeed, the Marlins had to go beyond starting over. The club made a move in the right direction in 2012, moving to its rightful home in the Little Havana section of Miami and changing its official location to "Miami," before the manager, Ozzie Guillen, made his bone-headed declaration of love for Fidel Castro. Then, a cast of veteran players tanked. No slack here for Marlins owner Jeffrey Loria, but there's also no reason to spend a bundle and finish in last place. It's more fun watching a young club try to improve. Top-half position players — 3B: David Wright, 5, 5.9; CF: Juan Lagares, 10, 3.7. Totals: Two players, 9.6 WAR. Second-level position players — Daniel Murphy, 150, 1.8; Josh Satin, 194, 1.2; Curtis Granderson,195, 1.1. Totals: Three players, 4.1 WAR. Top-level pitchers — Bartolo Colon, 14, 5.1; Dillon Gee, 78, 2.2. Totals: Two pitchers, 7.3 WAR. Second-level pitchers — Zack Wheeler, 170, 1.2; Carlos Torres, 197, 0.9; Bobby Parnell, 211, 0.7; Jonathon Niese, 220, 0.7. Totals: Four pitchers, 3.5 WAR. They say it's worse in New York to be irrelevant than the be terrible. The Mets are both. They made a little bit of an effort to improve with the free-agent additions of Colon and Granderson. But it won't be nearly enough. We didn't include pitcher Matt Harvey here because he is out all season with injury, but he would have added 5.2 WAR to the pitching staff. He and Colon would have given the Mets a front two in the rotation to rival anyone outside the Los Angeles Dodgers and Seattle Mariners. David Wright is a great player. Not much else to say here.